We have just got back from a week in Costa Rica – what an amazing, beautiful and interesting place… We were staying on the Caribbean coast, on the far South East of the country, so after the best part of the day flying to San Jose we had a 5 hour drive ahead of us, over the mountains and rain clouds, behind very slow queues of traffic, to get to our final destination. At one point, stopping for a snack in what felt like the middle of a raincloud, we were warned against ‘bad men’ in the mountains and told not to leave our car out of sight – this fortunately was the exception and not the norm. As in all the best trips, the journey there was soon forgotten in exploring our corner of CR. We were right on a lovely sandy beach, bordered by palm trees on the single road that ended a couple of villages along from our little town. We explored animal rescue centres and met sloths, monkeys, snakes, ocelots, spiders, snakes, land-crabs, lizards, frogs etc. One of the most memorable meetings was with a wild sloth that was feeding on a branch over a river – our small boat passed right underneath her – we were practically within touching distance. They are such gentle, relaxed and peaceful animals which are not yet properly understood – so little is known that they are having trouble releasing rehabilitated animals in the wild. Wild sloths have an algal growth over them, which help with camouflage and they have an amazing ability to heal themselves of injury, which is needed, as they fall out of trees a fair bit apparently. Seb, Garnet and I had a fantastic hike through the jungle with a local guide, who was able to explain all the different plants and animals that we encountered and warn us not to approach seemingly innocuous wildlife, such as ants and various plants. It really does feel as if everything is out to get you though – plants are spiky and venomous, insects can give you a bite so painful that it feels like a bullet and poisonous critters lurk seemingly in every nook and bit of undergrowth. Besides from that though, it was wonderful to be in the middle of the jungle following paths that are barely there, surrounded by gigantic plants, that you normally see in a small scale in someones designer apartment. In terms of trail mix, we had none, but fortunately, just as Seb was flagging, we came across some ripe cocao pods, which are full of a sweet fleshy fruit packed with caffeine – perfect! Another highlight of the day was a boat trip to a landlocked, mangrove-edged lagoon, complete with a troop of monkeys asleep in the trees, the thrill of which was only usurped by a real live manatee coming up for air just off the shore. There are so few of them in the wild, it was a real privilege to see one in the ocean. We had a few more more jungle/rainforest walks – there is just so much to take in, and so much to learn. Wherever we went, there were stories about how resin from a particular plant could be used as a medicine, or how another is used for building materials etc. It was humbling and overwhelming to realise how much there is that we just don’t know about, and the scary thing is that we are all slowly destroying it. The local tourism places are all focussed on being ecologically sound and aware. In particular, we went to several chocolate factories/museums. One stood out – it was set up as a research base for growth, harvesting and simple production of chocolate, with the intention of passing on their knowledge to the locals. I don’t think I could touch another mass-produced chocolate bar (unless there is an emergency e.g. running out of organic, fair-trade chocolate). There really is no better way than sampling freshly, hand-produced chocolate than sitting on a deck, overlooking the jungle canopy with the caribbean shining in the distance – bliss. The only question is: why wouldn’t you go there? 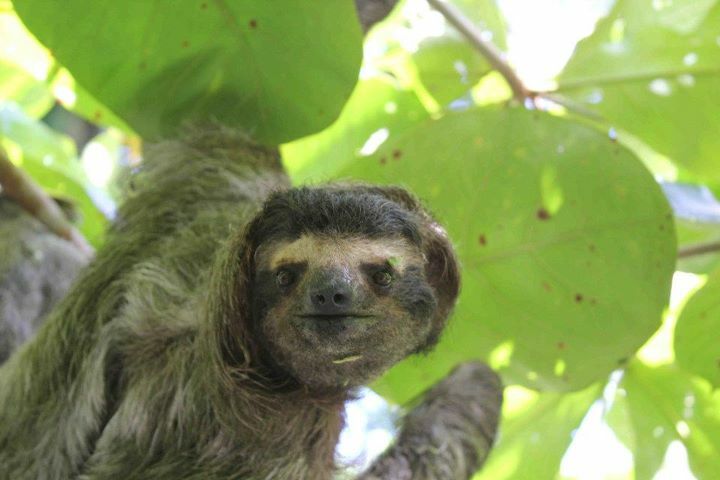 This entry was posted in Adventures and tagged Beach, Costa Rica, kids, sloths, the boy, travel on October 12, 2011 by emma. Wow! Sounds like you had a fantastic trip.